MistyMcIntyre.com » Blog Archive » First Book Club Meeting….SUCCESS! So, I just returned from my first book club meeting and it was Fabulous! 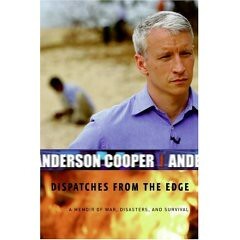 We read Anderson Cooper’s memoir “Dispatches From the Edge”. Normally I am not a non-fiction, biography or memoir fan, with the exception of material discussing Emily Hahn or great adventures in general, and I especially stay away from anything discussing war and human suffering. It isn’t that I’m indifferent, quite the opposite. I am so sensitive to the suffering that I can barely watch the news. Immersing myself in tragedy is difficult and I have found that tragedy, sadness and/or disappointment often drives me to overwork myself. This book is so much more than a war correspondent looking to capitalize on his experiences, inflame the world at large or anger those in power. This book threads together tragedies that occurred all over the world (Sri Lanka, Somalia, Rwanda, Bosnia, Louisiana) and demonstrates the depths of human misery and the hope that people find in darkest hours. What I loved most about this book is similar to what I loved about Al Gore’s documentary “An Inconvenient Truth”: that the author assists the reader in relating these truths back to their lives. It is not enough that I watch the news and know tragedies happen. It is not enough that I am told global warming is going to kill the human race, maybe sooner than later. What this memoir does is find a way to relate these foreign experiences to my existence. What I treasure about these two examples is that Al and Anderson weave their own experiences and driving forces into the story. For Al, his education and the death of his sister…not preying on people’s emotions, but rather emphasizing that these are first hand issues. For Anderson, the death of his brother and father. How painful to lose a parent at 10 and a brother to suicide at 23. How would that force you to run into the fire a hundred times, trying to find solace in hiding from your own tragedy. This book also serves to push me further into my address of a question I have been debating for years now and it is about consumerism. Let me start by saying: I LOVE MY COUNTRY. I am proud that I am an American and I am not ignorant to the rights and privileges that it provides me. However, I believe that we as Americans have gotten “soft” so to speak. I read about mother’s in Africa watching their children die from malnutrition and the doctors telling AC “they don’t want your sympathy, they want you to do your job” and I get angry. Angry because after 9/11 people laid on their couches and used the bombings as an excuse to get out of work. They enrolled in therapy and stated they are just “too emotional” to get through their day. I had students at the university telling me they just needed more time on their 5 page papers because they have just been too depressed to do the work since 9/11 (this is in march of 02) and I think, “What have we become?”. Mothers in Africa watch their children die and walk 10 miles home to their 1 room homes to care for their other children, do the wash and move on with their life and we use tragedy as an excuse. Granted, we’ve seen so little true devastation in our country how could we not be a little weak. How does this relate to consumerism you ask? If we lived in a country where we didn’t surround ourselves with things: decorated pillows, fancy electronics, 20 different creams for every part of our anatomy, frivolous expenditures in general, would we stop cutting ourselves off from the world and start to fear? I think we sometimes are so comfortable due to our spending that we often use things to cushion our emotions as well as our bottoms. It may be a frivolous thought, but think of the African mother that walked her 2 year old child 10 miles to see a doctor for malnutrition in the middle of a national famine. She watched her child die, walked home and cared for her family. She has not photograph, no crudely drawn art work, no birth certificate, nothing that indicates he existed and that she has the right to mourn. In America we drive our child to the ER, we fret, we pay, we hope, we receive support from dozens of people, our child dies and we blame the world. We drink ourselves stupid, we curse God, we take weeks off of work. Is this wrong? NO! by no means am I implying that it is wrong to mourn and grieve. I only suggest that if tragedy were a part of our everyday grieving, would we be better for it? If we truly mourned the victims of Katrina? If we prayed daily for the deaths of children from curable diseases, from hunger, would we put our own pain in perspective? Would we be able to separate what is lasting from what is unnecessary? Just a thought. In Peace…..